Squat globular jar with two broad string-hole handles on shoulder. 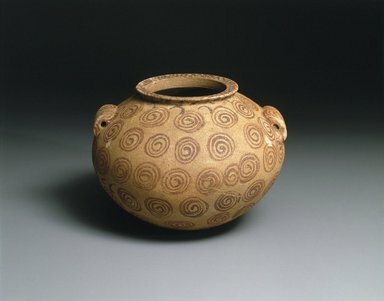 Reddish pottery, decorated, in reddish brown painting, all over with spirals in neat rows; a central one on bottom; semi-circular strokes around neck; a dense criss-cross pattern on lip, radiating line on its underside. Rounded bottom. Straight mouth. Thin lip, flat-topped, underside bevelled to very short neck. Well potted. Condition: Good. Two chip in bottom, one in one handle. Lip abraded around edge and slightly chipped. Some efflorescence.